Tucked into a corner of via Bagnoli Croci in the beautiful village of Taormina, Sicily, is the Majolica Pottery Shop owned by two artistic sisters. They have been throwing and painting unique handmade ceramics in their shop for less than a year, and have developed quite a following in their happy little store. Their cheerful designs are typical of this region—sea creatures, sunrise, olive trees, and lemons. All coloured and finished with a whimsical little twist. It was such a pleasure to discover this little shop and enjoy all the beauty they’ve created! These are the words of Mary Lou Peters our wonderful artist-in-residence on the recent tour that I led to Sicily. As an artist Mary Lou sees things a little differently from me – she sees colour, form and texture. Whilst I notice conversations, words, expressions. In fact when I first met Elvira, one of the sisters, she was negotiating with the ‘fish man’ stood at the threshold of her shop. She was debating the price of the fresh fish that he was selling. Gently requesting a better price. I noticed her because she was quiet, unassuming and she was wearing an electric blue jumper. I was secretly pleased that even the locals had to insist on a good price from the fish man – not just the tourists. The night before we’d been subjected to an expensive, and not very good, dinner in a nearby restaurant and my hackles were still raised. It takes guts to open a business, a small business, that your family depends on. Two families in fact. That’s exactly what sisters Elvira and Maria have done. Just about a year ago they rented a shop on one of Taormina’s quaint little streets and they set out their stall. They’ve taken their skills of pottery-making and painting and created a unique and highly personal line of jugs, cups, pots, plates and bowls. Their shop is brightly lit and inviting. It is filled with their work, all hand-made and hand-painted. The shop is filled too with their determination and passion. Whilst you can’t see these emotions, they are there in every little dish, every delicately painted surface. At the back of the shop the ladies each have a work station, one on the left and one on the right. Then in the dark recesses at the very back there is a curtain, and behind the curtain there is a kiln. Every day they open the shop around 9.30 am, they stay open all day, often until 11 pm at night, in the high season. They split the day between them, one opens up and works until mid afternoon the other does the late shift into the night. In high season they open seven days. The ladies are modest, almost shy, I compliment them on their shop and their beautiful work. I purchase a variety of pieces, in fact I’m using their mug, back home in England right now! It sounds like a cliche, well it is a cliche, but I feel I’ve brought a little of the Sicilian sunshine home with me to rainy England. Every time I use one of the tiny coffee cups or make myself a cappuccino in the hand painted mug (with lemons on it), I think of Elvira and Maria in their little shop. I hope they are having a good day. I hope the fish man gives Elvira a good price. I hope the sun is still shining on their little corner of Sicily. Elvira and Maria’s shop is called Majolica. The address is: 6 Via Bagnoli Croci, Taormina, Sicily. Tel: +39-328-014-6673. Thank you for including my observations in your post, Janet–I am honored! 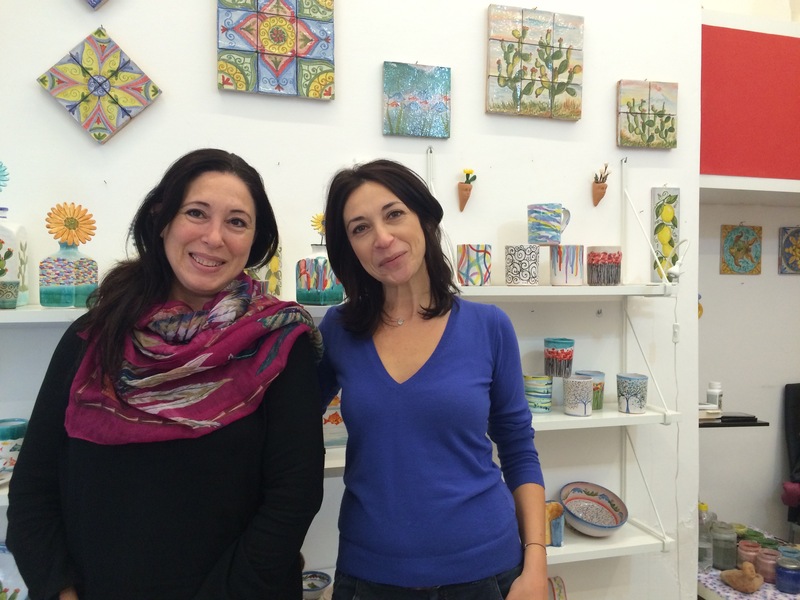 Your words and photos take me right back to the Majolica Shop–I wish Elvira and Maria a good day too, and hope they will keep spreading their special brand of sunshine for many years to come! It was a fabulous discovery – and I loved the way you described their work too! we are really excited about the words spoken about our work. thanks to have discovered our shop!